Youth Leadership Camp, started 18th June at MM (Deemed to be University), concluded today. The camp witnessed a great blend of various sessions and activities. 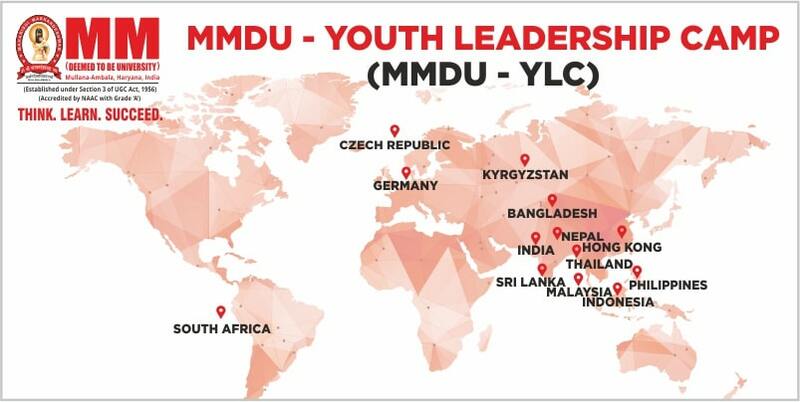 As many as young leaders of 13 countries participated in the camp from all over the world and participated in all the events with great enthusiasm. University associates, during the event, worked together for day and night to make the camp a great success and to make students aware of various topics like SWOT analysis, Behavioural training, Positive interdependence, Self- leadership, Self-branding, and then some. In the morning, fitness sessions with the inclusion of sports, exercise, aerobics, and swimming were also arranged for the young leaders. During the visit, young participants also attended Yoga Session at Kurukshetra on International Yoga Day. Lectures and discussions on diverse topics were appreciated by all the visited students. Young leaders were also happy to watch the culture of the country by visiting various places, including Kurukshetra and Chandigarh during 6-day camp. It was awe-inspiring to see the young leaders from various countries showing prodigious interest in knowing the Indian culture. In the evening, fun games, cultural events, and talent show were also arranged for the young leaders of different countries. Students enjoyed dancing with the MMDU students on Haryanvi folk. It was great watching them to dance with lots of courage and zeal. Declaring the close of the Youth Leadership Camp, young leaders said that they will surely visit the campus again and also recommend their friends to study here. While bidding adieu to all the young leaders, MMDU Vice Chancellor honorable Dr. Victor Gambir wished all the young leaders best wishes and inspired them to scale heights from great learning they received through the camp. Along with learnings and memories, young leaders were gifted with an inspirational book namely “The Switch”, a LifeBook about “from Good to Great”, written by Executive Director of MMDU Mr. Vishal Sood.